Our beautiful Sunshine…finally in a home of her own. If you work in Animal Welfare or Animal Rescue, you know the mixed feelings that come with helping an animal heal enough to move forward into a home of their own. There is joy that the animal you have put so much in to has finally found a family and a safe place to land. There is a feeling of satisfaction at a job well done. And there is the grief of turning loose of someone who has become so important in your life. Don’t let anyone fool you…the pain is there….whether this is your first foster/adoption, or your 500th. There is always that second of doubt that you are doing the right thing. Will these people love and cherish your friend the way that you have? Will they be kind and patient? Will they provide the right care, attention and food? Will they appreciate the quirks that make this dog, cat, bird absolutely unique? To be honest, dwelling on feelings like that can become paralyzing. It is the beginning of a downward slide which can ultimately lead to hoarding. The moment you stop reminding yourself that this animal deserves a home of their own, is the moment you begin believing that no one can care for them they way you can. And you begin putting up road blocks and hoops for potential adopters to jump through. You make the process so onerous that no one could meet your criteria. You put so many control measures in place that people stop even trying to work with you. And the animals suffer. I am extremely fortunate to work or an organization where the animals who live here are welcome to stay here as long as necessary; forever if they do not find adopters. But our goal…our wish…our efforts are all geared towards getting them into a home. My former supervisor once said “we want to adopt to the people who want to adopt from us”. I constantly remind my staff that we are, at best, an orphanage. 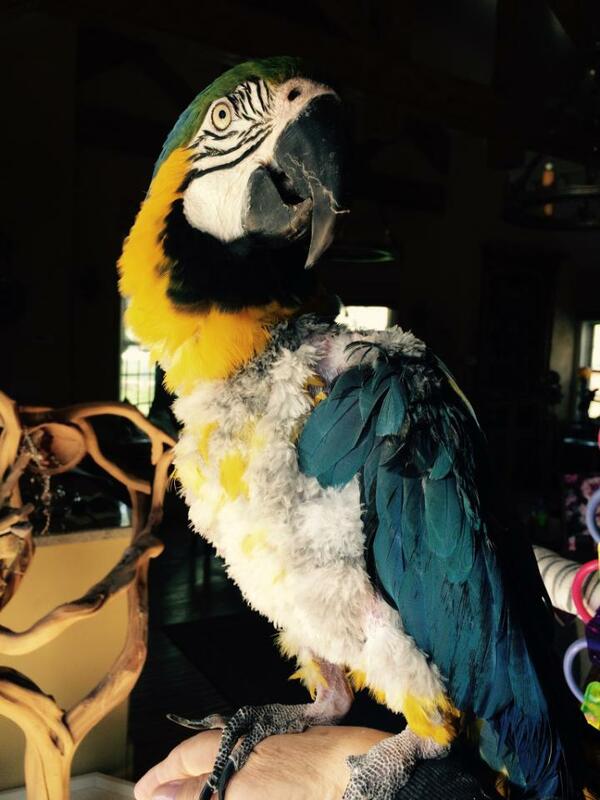 Our birds deserve to be a pampered darling in someone’s home. One of our criteria at the Parrot Garden that I absolutely will not change is the requirement that people come here to meet the birds. That allows us to find the best possible match between bird, people and lifestyle. And many of the people who come do not have the necessary knowledge to properly care for exotic birds. In a word, they are not ready. It is our job as caregivers to help them become ready. To offer the knowledge, resources and skills required to be a great birdie parent. To that end we have handouts, booklets, and articles to give them. We send them with food, toys, perching and even sometimes an appropriate sized cage. We celebrate the adoption. We take pictures to post on social media. We give the family an adoption certificate. We exchange email addresses and last minute information about this particular bird. We tearfully wave goodbye as they back out of the parking lot. And all the while a quiet voice in my head is questioning if this is the right home for this bird. In order to continue to save birds, I have to find a way to still that voice. And at the end of the day, there is no denying that there is an empty cage, an open spot, a missing member of our family. And it hurts. And it always will. But the hundreds of successful adoptions we’ve had are only possible because we keep trusting others to help share our load…to make a space for the next incoming bird who needs a safe shelter. Yesterday two of our long-term residents went home. To an amazing and dedicated family who have the resources and experience to give them an absolutely fabulous life. I know these kids have hit the jackpot. But that doesn’t mean I don’t feel their loss, and shed a few tears; missing them. And today, there are three new birds in our quarantine building. Birds that desperately needed rescuing. The only reason I could say “yes” was because of the birds who were going home. And the cycle continues. My hope, my prayer, is that someday it will no longer be necessary.